There aren't many performers who are a half century into their career that can still sell out sports stadiums on a regular basis. 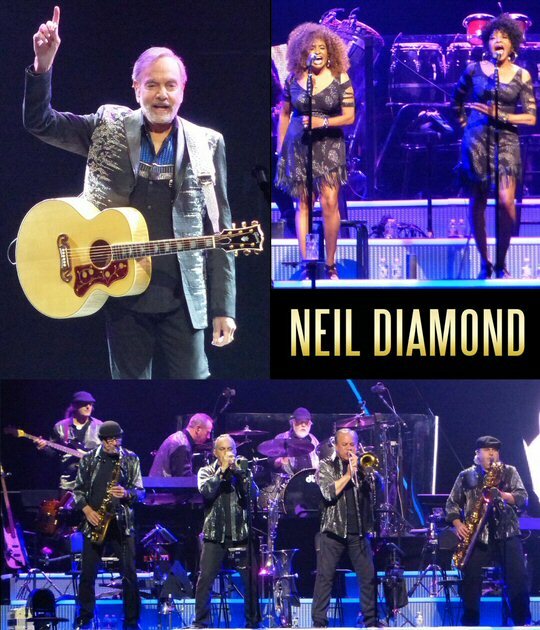 But, Neil Diamond is one of those special artists and his 50 Year Anniversary World Tour stop in Nashville wowed and won over the sometimes musically finicky crowd in Music City when his large band hit the stage at the Bridgestone Arena on April 19, 2017. 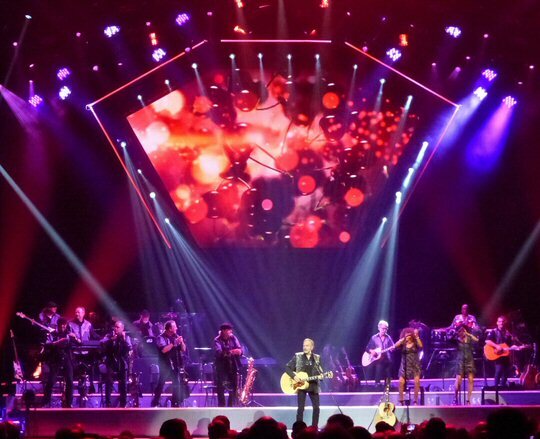 Neil Diamond and his band get off to a shining start in Nashville. Neil Diamond is one cool cat and like any good gemstone - he's got a lot of quality cuts - and he got into them quickly in Nashville. "Cherry, Cherry" had the full house on their feet as Neil armed with a fine sounding acoustic guitar moved from side to side engaging the audience. Soon, the pace fell back with the moody "September Morn" and the crowd favorite had the ladies swooning. In fact, at this show we learned a bit about this multi-faceted performer and I think we came away with a greater understanding on why Mr. Diamond was always a major draw for his female fans. He masterfully built the show fluctuating between slow and fast songs. Some were tender - others more forceful - with all ultimately leading to a much anticipated climatic encore two hours down the line. Talk about stamina! But, long before the flashy finish Diamond offered many choice songs during a catalogue-spanning set that contained nearly 30 numbers. He called "Play Me" one of the most personal tracks he has ever recorded. "Song Sung Blue" was turned into a Music City sing-along. "I'm a Believer" reminded fans of Diamond's songwriting roots at the Brill Buidling where he penned this hit for The Monkees. "Brooklyn Roads" offered a fascinating glimpse into Neil's New York upbringing enhanced with clips from early home movies shown on the Bridgestone's diamond-shaped big screen. Throughout his illustrious and wide-ranging musical career, Neil Diamond has sold over 130 million albums worldwide and has charted 37 Top 40 singles and 16 Top 10 albums both in the U.S. and internationally. He is a Grammy Award-winning artist and a member of the Rock and Roll Hall of Fame. In 2011, Diamond received the prestigious Kennedy Center Honor for his lifetime of contributions to American culture. The U.S. leg of this current tour will conclude with performances on two "Hot August Nights" in Los Angeles before taking the golden anniversary showcase around the world. Speaking of a Hot August Night, Diamond featured several fan favorites from this 1972 release during the Nashville engagement. That double album was culled from one of ten sold-out concerts that Diamond performed that month at The Greek Theatre in Los Angeles and the recording revealed Neil to be a captivating, charismatic and energetic entertainer. "Done Too Soon", "Holly Holy" and the anthemic "I Am ... I Said" was a solid three-pack in Music City. The living legend celebrated 50 years in the Music Biz in Music City. A more recent anthology released to coincide with this momentous career milestone is Neil Diamond 50 - 50th Anniversary Collection - a 3 CD set that marks the 50th anniversary of the iconic, Grammy Award-winning and Rock and Roll Hall Of Fame member's first hit "Solitary Man." The collection from UME and CMG is a comprehensive retrospective of 50 Neil Diamond selections from albums ranging from his earliest 1966 record The Feel Of Neil Diamond through his latest critically acclaimed album Melody Road. Neil Diamond 50 - 50th Anniversary Collection includes liner notes by David Fricke as well as a booklet containing photos that chronicle the artist's vast career. At one point in the show a fan behind us gushed "he's so Vegas" a statement that fit in well in the Tennessee State Capitol that goes by many nicknames including the glitzy "Nashvegas". But a label like that could be misconstrued to say that Diamond might be going through the motions - since, let's face it - he's been doing this a long time. You might even anticipate that at 76 years of age that Neil might be a bit of a "rough" diamond. But, this was absolutely not the case - not at all. All we saw was a living legend fully in command as he confidently led his 13-piece backing band through a triumphant night of moving music. And, that night concluded with a four-song encore that included two of his biggest hits opening with the obligatory "Sweet Caroline" complete with a chorus - that as you might expect - went on for a while with enthusiastic participation from the capacity crowd. When the stage lit up in red, white and blue you knew the evening was nearing its conclusion with the proud and patriotic "America" before sending everyone on their way with an expanded "Brother Love's Traveling Salvation Show". 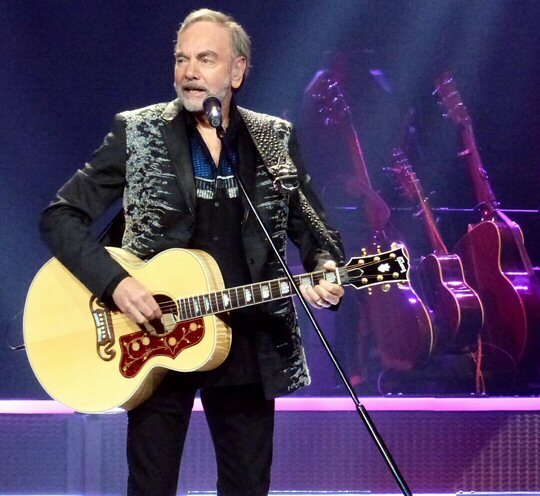 Neil Diamond's 50 Year Anniversary World Tour is off to a smashing start and the stop in Nashville was nothing short of golden. However, the "diamond" anniversary that traditionally marks 60 years is still a decade away. It will be interesting to see if Neil takes to the road at 86 for a tour as extensive as this one. If he does he'll no doubt be still sparkling in the spotlight just as he did on this night in Music City. The Bridgestone Arena in the heart of downtown Nashville is home ice for the Predators. It also hosts a wide array of sporting and musical events such as the Neil Diamond concert. Upcoming events at the venue include the UFC, Daryl Hall & John Oates, Iron Maiden, James Taylor, Queen + Adam Lambert, John Mayer and Roger Waters. More scenes from the awesome Neil Diamond concert at the Bridgestone.